South African artist Peter Van Straten is known for his beautiful depictions of mystical and surreal images painted in oil color. His art transcends time and brings back the luminous feel of painters from the Golden Age. Raised in Cape Town the artist went on to study Fine Arts at the University of Stellenbosch. His exhibits have been hosted in well known galleries in South Africa and New York City as well as London. The artist was well received at the Lightworkers Conference in NYC and at the Chalk Farm Gallery in London. In fact, the set decorators for a Quentin Tarantino movie requested the artist’s participation in their production by lending them his artwork. Peter Van Straten’s artworks are un-stretched and not framed unless requested by the purchaser. The archival prints are created with cutting edge use of technology. The special ultraviolet pigmented inks are printed out on durable Hahnemule German canvases that are specially coated. Each of the artist’s prints is signed, certified and the artist himself mentions the edition and title on the print. Each of these prints is guaranteed with more than 80 years of archival rating, which provides eight decades of protection against fading. 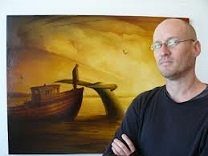 The price range often averages about US$800 for a work created by South African artist Peter Van Straten. Van Straten’s first exhibit was a group exhibition in the year 1991 held at Stellenbosch in South Africa. The second one was organized in 1992 where the artist went on to exhibit his infamous “Pieta” at the Grahamstown Festival. That was followed by a Solo exhibit in 1993 at the Melville Visual Arts Foundation, Melville. In 1996 a group exhibition was organized at Primart, Claremont and another Solo exhibition was held at the same location the following year in 1997. The same year the artist exhibited at Chelsea Gallery, Wynberg and in 1998 he was commissioned to paint two unique images for the residence of Mr. Mac Maharaj. Another Solo exhibition was held in Labuschagne Residence, Durbanville in 1998, which was followed by a group exhibition at the Cape Town-based Peter Visser Gallery in the same year. The London exhibition at the Chalk Farm Gallery was a solo exhibit in 1999 followed by another Solo exhibit at the Chelsea Gallery in Wynberg. A solo exhibition at the Amani Wine Farm in Stellenbosch and an exhibit at the Intecaf, Observatory, soon followed the Lightworker’s Conference exhibition in New York City. There have been many more exhibitions since that time. Especially notable ones included year 2000 exhibitions of a series of paintings entitled the Whale Paintings at the Grobellaar Hall, Hermanus and the Two Ocean Aquarium. That was followed by the Peter Visser Antiques showing and an exhibition at the Old Arts Gallery in the University of Pretoria. The artist was also commissioned to produce a statue of the Virgin Mary for the Roman Catholic Church in Kimberley. That was followed by the 2001 Solo exhibition entitled the Namaste at Third Eye Gallery. A well-received solo exhibit was held in 2003 at Obs Café, Observatory. The artist has also participated in the 12th Knysna Fine Arts exhibit in Knysna as well as the 2004 13th Knysna Fine Arts show in Knysna.